Thank you to the Manley Art Center Gallery in Brookings, OR and all of those who attended my gallery reception in early 2018. The question and answer portion of the day was really fun! Watch the video here or view photos of the event here. Brian Childers is an award winning artist specializing in turned bowls, containers, vessels hollow forms and more. He began turning wood a decade ago with a beginners lathe and a few inexpensive hand tools. Childers creates creative and stunning pieces of functional art and gallery-quality display pieces from his hillside workshop near the coast in Brookings, Oregon. Most pieces start through the selection of fine grained woods like mahogany, bocote, blackwood, Siberian elm, cherry, Alaskan yellow cedar, and many others. 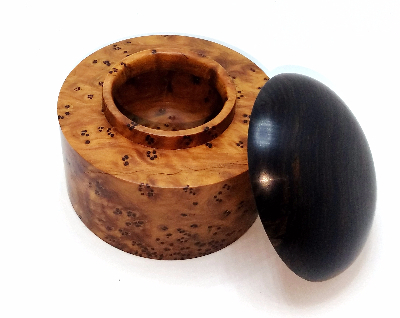 Every now and then, you’ll find hand-made marbles, ball bearings, fossilized tusk, jade, or even a peep hole included in a container that makes a piece even more spectacular.